Brian and I continued to wait out a blasting northeast wind before moving once again to cross the Albermarle Sound. 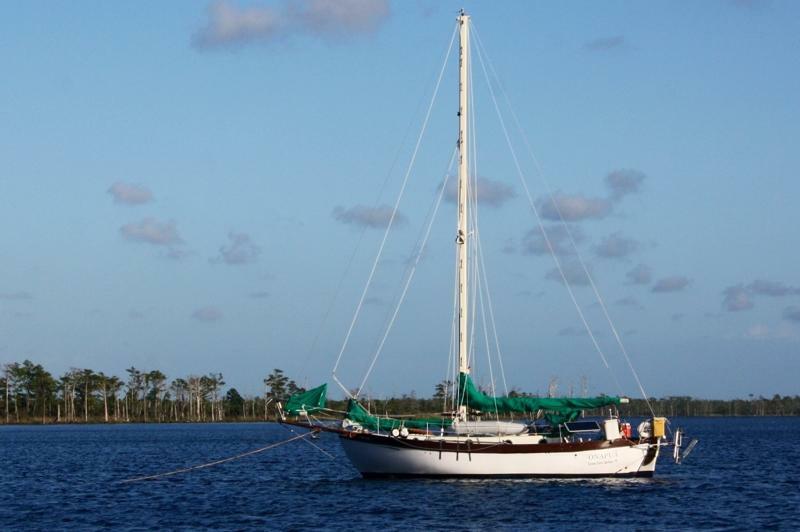 We’d grown quite fond of our anchorage behind Durant Island; waking when the crabbers came ’round to check their traps, watching the local Ospreys hunt, fishing for our own fresh Blue Crabs for supper, and each night watching the sun fade away behind an untouched, North Carolinian wilderness. We tuned into local radio stations to get a good does of NPR news and stories, hip-hop, and country. We were well connected to the outside world with 4G which enabled us to check emails, chat with family and friends, and do some much needed researching pertaining to outfitting the new Alliage 41 awaiting us in France. We had been moving, moving, moving! In truth, for the moment, we were enjoying our solitude prior to our return to the hustle and bustle of land. We invited Peter to join us for dinner. As it turned out plain ‘ol black beans, corn, cheese, and homemade tortillas were a tasty meal after a hard day’s travel! 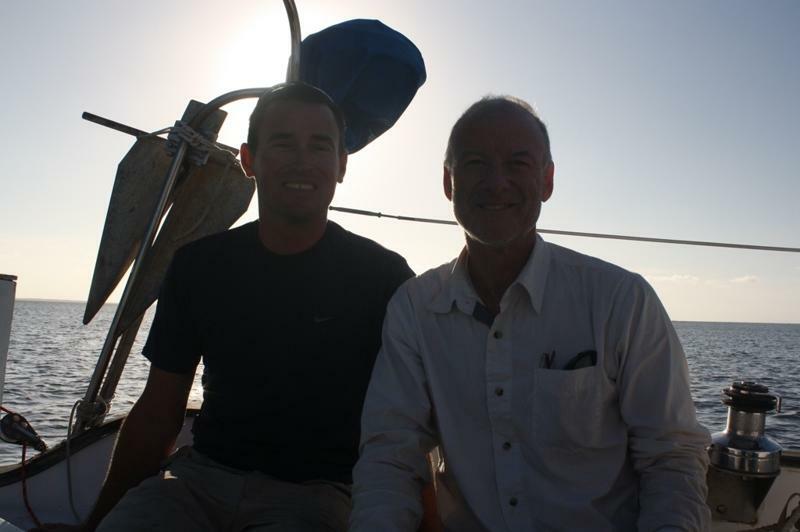 We were honored to learn that Peter has followed our travels by reading our blog and that some of our decisions were helpful to him throughout his own sailing preparations. Brian, Peter, and I swapped sailing stories and talked technical about Westsails. Peter’s enthusiasm for his newfound sailing lifestyle reminded Brian and I why we too love this lifestyle. There is a connectedness here with fellow cruisers and an appreciation for the natural beauty that surrounds us. 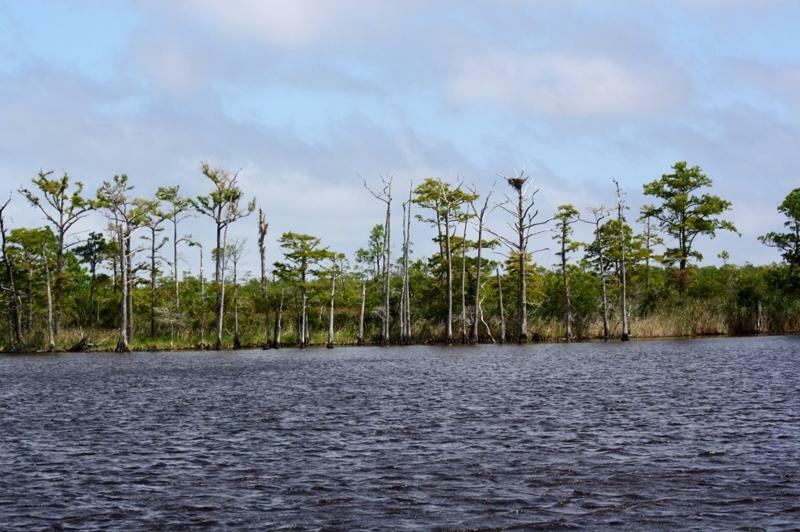 This entry was posted in Uncategorized and tagged abermarle sound, aicw, alligator river, atlantic intracoastal waterway, durant island, ICW, Intracoastal waterway, North Carolina, onapua, Rode Trip, westsail, Westsail 32 by stephanie. Bookmark the permalink. That was a nice surprise visit. You never know what lives you touch with your blog. I am happy one found you today. That is exciting. Ah. How cool is that? Hi Brian & Stephanie! We met you today with our children (and Scouts!) at the dock at the Dismal Swamp State Park as you were headed up the ICW in NC. Thank You for being so generous with your time and home and talking with us and letting the kids climb aboard. We always love to meet sailing couples; it reaffirms our dreams for when Russ finally retires. You’re right about the passion amid those who are involved in the sailing community. Part of the draw is the camaraderie! Wishing you both safe travels to France and will continue to follow your blog along the way. We will be sure to send the pics of the girls with you both from today.